Want to know more about Hilleroed, Or select a region, area or city you want to study further. News and debateHilleroed and Denmark. You can also find Motels - Restaurants - Bed and Breakfast - Dining Guide ect. or read more about Hilleroed. Frederiksborg Palace is a renaissance castle in Capital Region of Denmark Denmark - Europe, located in a beautiful area Visit Frederiksborg Palace and discover this area of beautiful and varied scenery, Frederiksborg Palace can offer many exciting experiences, good Restaurants and hotels, are you maybe looking for a Bed & Breakfast or camping space, you can choose from a range of options, Whatever where you go in Hilleroed, you'll always find a friendly smile. To make room for the new Renaissance palace, the bulk of an older building complex that Frederick II had acquired in 1560, demolished. The Building complex is located on three islands in the lake. The buildings on the southernmost island comes from Frederick II's time. Frederiksborg Palace is inspired by traditional Dutch building styles, like many other Christian IV buildings, for example, Rosenborg Castle and Exchange. Walkway makes it possible to walk around Castle Island. In 1622, the great Neptune fountain was erected. the Bronze figures was made in Prague by sculptor Adrian de Vries. The Square in front of the audience hall was used for tournaments and ring jousting. The beautiful wrought iron balustrade in the ring jousting sport performed by Caspar Fincke. King Albert C4 is seen in the middle. The Baroque Garden at Frederiksborg Castle was built in 1720erne led by the architect Johan Cornelius Warrior. The garden is completely symmetrical and follow the castle's central axis with a perspective into the landscape. Frederiksborg Castle's baroque garden changed through the following centuries, but in the 1990s, the original baroque garden was restored with cascades and parterre beds. 17. December 1859 large fire destroyed a majority of Frederiksborg Castle interior. Only the Audience Hall and the majority of the church escaped the flames. 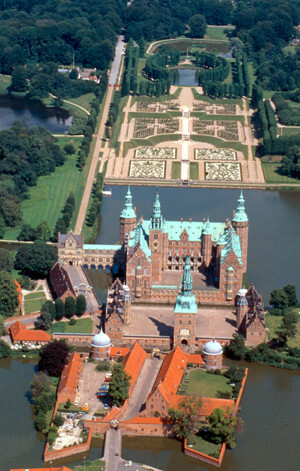 In the subsequent years, Frederiksborg castle was rebuilt. In 1864, the work on the Frederiksborg castle's exterior was completed and the chapel could be used. 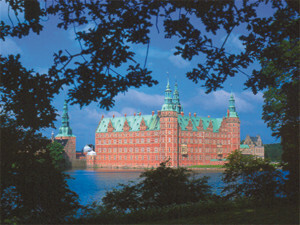 Carlsberg Brewery founder J.C. Jacobsen offered to finance the restoration of Frederiksborg castle's interior, if Frederiksborg Castle was converted into a museum. In 1878 established the Museum of National History at Frederiksborg as an independent department of the Carlsberg Foundation. Frederiksborg Castle chapel, whose interiors was limited destroyed by fire, is a´ testimony to the splendor of the original Frederiksborg Castle. In Frederiksborg Castle church's south end, over the altar and pulpit, says Compenius. Every Thursday between 13.30 and 14.00 is a concert with music from the Renaissance. The chapel is also working chapel for the Danish knight orders: Elephant and the Danish Order of Dannebrog. Secret passage leading from the main palace into the Audience Hall. The interior is from the 1680s and inspired by Italian and French baroque. The walls of the secret passage is contemporary Italian and Dutch paintings from the 1600s. The portraits in the Audience Hall depicting the Oldenburg kings, while war scenes above are from the Scanian War 1675-1679. Both the secret passage as Audienssal one of the few well-preserved royal interiors of the old absolutism. Frederiksborg Castle Museum is Denmark's national gallery of portraits and covers the period from 1400-century to the present day. The museum also has a significant collection of decorative arts. The objects on the ground 48 rooms represents the Rococo and originates from Frederick vs. time in the mid 1700's. Portraits of famous personalities from the early 1900-century to today are exhibited in the Modern Collection. The museum owns a large collection of portrait photographs, presented in changing exhibitions. Frederiksborg castle museum is equipped with disabled facilities such as lifts and toilets. The Danish royal family is well represented in the collection. The portrait of Christian IV, 1577-1648, painted by Pieter Isaacsz approx. The 1611th The picture shows the confident king on top of his power. Jens Juel was the leading portrait painter in the latter half of the 1700s. The portrait of writer Thomasine Buntzen, 1773-1856, representing the bourgeois women from 1700-century last decade. The portrait of Hans Christian Andersen, 1805-1875 performed by Elisabeth Jerichau-Baumann in 1850 and was one of the depictions as storyteller himself enjoyed most. The painting of Karen Blixen, 1885-1962, conducted by Kay Christensen in 1955. The writer became world famous with novels like "Seven Gothic Tales"and "Out of Africa". Entertainer Victor Borge, 1909-2000, photographed sitting on an imaginary piano by Ole Haupt in 1995. History painting has a prominent location at the Frederiksborg Palace Museum. Brewer Jacobsen wanted to visualize the history of Denmark by large narrative pictures. One striking example is Otto Bache painting from 1882 "The conspirators riding from Finnerup after King Erik Klipping homicide in 1286". After the Kalmar War 1611-13 Christian IV commissioned a series of tapestries in Delft, which turned the king's farms and victory over the Swedes. One of the motivations to beat the Danish fleet at the entrance to Stockholm. The original Tapestries were lost by fire in 1859, but a part of the series was later restored. Adam Oehlenschläger, 1779-1850, introduced romanticism in Denmark. Constantin Hansen s photo from 1866 depicts Oehlenschläger in 1829, where he was garlanded in laurel grove of the Swedish poet Esaias Tegnér as an expression of Dane s great importance for the Nordic poetry. Painter Niels Simonsen manufacture of the retreat from Dannevirke performed in 1864 is a fine example of a contemporary history painting. The scene with the six soldiers who pulls a gun forward along a snowy road, is one of the most famous motifs, which describes the Danish defeat by Prussia in 1864. Thomas Kluge "A short stay" from 1998, depicts Danish UN soldiers on patrol in Bosnia in 1995. History painting as a genre is still present in the Frederiksborg Museum´s collection. Among Frederiksborg Castle Museum s distinguished collection of furniture seen this fracture coffin from 1605. The coffin is a typical Renaissance furniture. It belonged to Hans Johansen Lindenov to Fovslet and daughter Margaret Otte Rosenkrantz. The coffin is believed to have been on Børglum Monastery. One of Frederiksborg Castle Museum s major attractions is the Gottorp celestial globe, which was constructed for Duke Friedrich III of Gottorp in arteries 1654-57. Inside the globe, which was restored in 2001, seen the sun in the center as a polished brass ball. Frederiksborg Palace Museum s exhibition of porcelain and glass, you can see the original Flora Danica porcelain, conducted at the Royal Porcelain factory from 1790 to 1802. Farmers in Norwegian national costumes from a series performed at the Royal Copenhagen Porcelain Manufactory around 1785 after JG Land Nordmandsdalsfigurer in Fredensborg Palace Park. Frederiksborg Castle Museum houses a significant collection of fabrics and embroidered tablecloths from the 1600s. They show contemporary advanced sewing and embroidery skills. The embroidered family arms express the nobility strong family consciousness. Other motifs are taken from the Bible and nature. Furniture Group subscribed in 1830 to the sculptor HE Freund for his own home. The inspiration for the furniture is picked up in the ancient world.